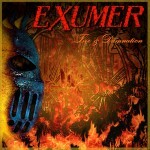 EXUMER have partnered up with Stereokiller to provide a special, limited stream of their new album, Fire & Damnation. The album can be heard now HERE between Friday, April 6th and April 13th. Fire & Damnation will be released worldwide by Metal Blade Records – April 10th in North America and April 6th/10th in Europe/UK. EXUMER recorded their first new album in 25 years with renowned producer Waldemar Sorychta (Grip Inc., Therion, Sodom, Moonspell, etc.) at the helm. The 10-track strong, hard-hitting CD Fire & Damnation combines a punishing production with aggressive song writing. 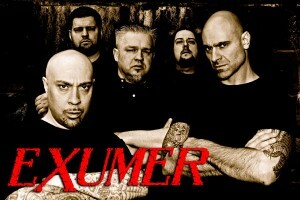 EXUMER manages to capture the intensity and feel of the 1980s thrash metal gems and yet sound up to date on their latest output. Watch out for Fire & Damnation to be released the 6th/10th of April, 2012! Fire & Damnation will be released as a limited Digipak-CD including three bonus tracks as well as on vinyl! Make also sure to catch EXUMER at the Evil Horde Festival taking place at the Zeche Carl in Essen on May, 12th! DEVIL YOU KNOW: Artwork and Album Details Revealed!